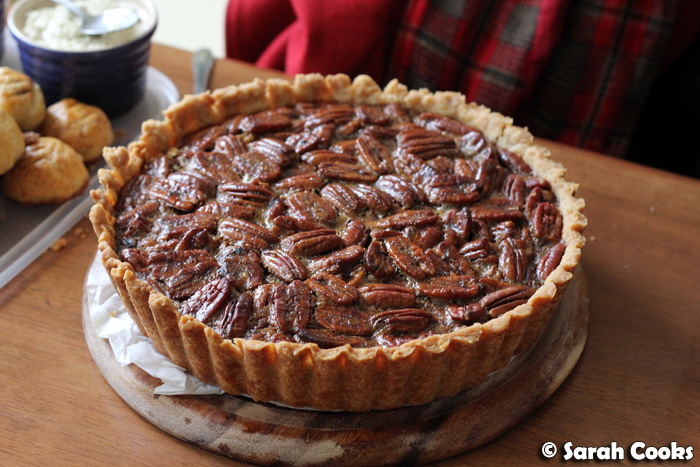 So, when we hosted the Grand Annual Lobster Party of 2013, the dessert I chose to make was a pecan pie. Rich, sweet, expensive, decadent, yes, but it was Christmas, and if you're having a lobster pie for dinner, you don't want to follow it with something disappointingly restrained. Check out that gooey, sugary maple syrup filling. Heaven! 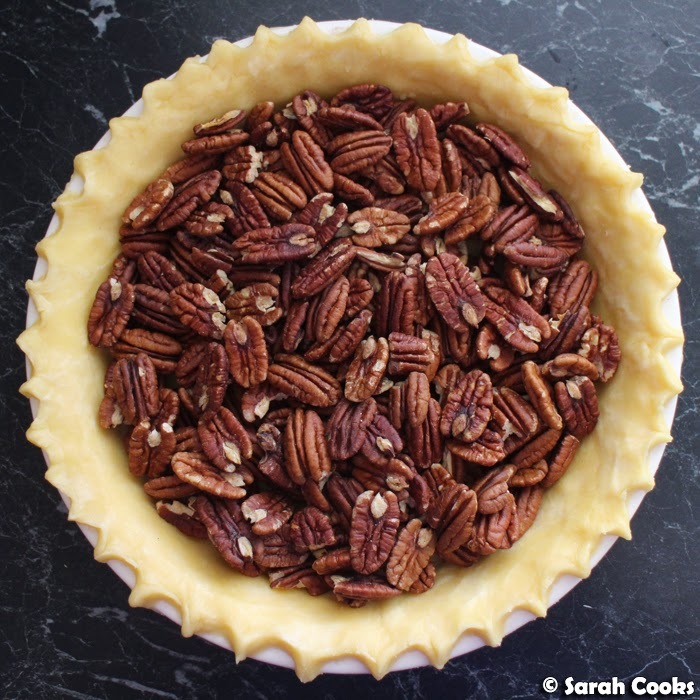 The first time I baked a pecan pie was in 2012, when I used Nigella's "Pecan Plus Pie" recipe from Nigella Christmas, replacing her mixed bag of nuts with purely pecans. It's a reassuringly simple recipe, and has the virtue of using golden syrup instead of the difficult to find corn syrup that traditional recipes use. 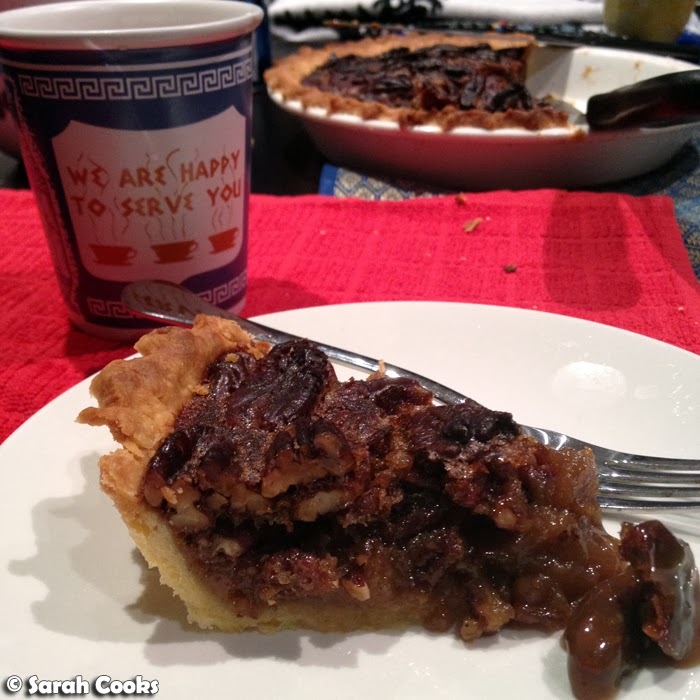 (Nigella's Pecan Plus Pie recipe is available on her website if you'd like to check it out). I brought it to a "Christmas in July" party, and whilst everyone enjoyed it, I still felt it could be improved upon. In particular, I thought the pastry was dissatisfying - Nigella uses a "rough dough" of flour, oil, salt and milk, which she instructs you to press into a pie tin. Whilst the pastry had a pleasant flakiness once baked, the result was quite messy and I missed the butteriness of a traditional shortcrust pastry. So when it came time to bake this next pecan pie, I made - you guessed it - a standard all-butter shortcrust pastry! Half the weight of butter to flour, you rub small pieces of cold butter into the flour, add a little salt and just enough cold water to bring it together. Rest it for thirty minutes, then roll the dough out on a floured surface and line a pie dish with it. Done! I decided to crimp the edges because I've seen it done that way on American TV shows and movies and I thought it looked pretty. Another change - I took a tip from recipes I'd seen all over the internet, and toasted the pecans first. Hot tip: they smell fantastic and you will want to eat them all! 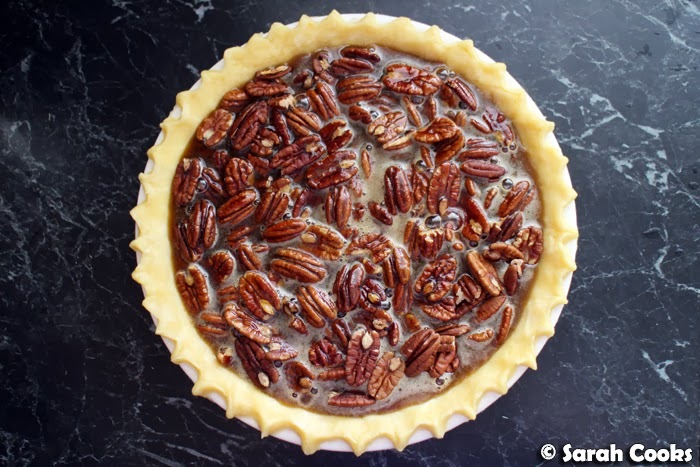 After all those changes - different nuts, different pastry altogether, different sweet liquid in the filling and added salt - not to mention the other tips I gleaned from general pecan pie Googling, I feel the recipe bears very little resemblance to Nigella's. So in my recipe below I've acknowledged it as being my version of a classic recipe, with the filling being based on Nigella's Pecan Plus Pie. I was a little worried that the pecans got so dark in the oven, but they didn't taste burnt at all - just sweet and smoky and caramelly and perfect. I think it's best served slightly warm, so that the filling is still gooey, with crème fraîche or whipped cream on the side. Place the flour, butter and salt in a large bowl. Using your fingertips, rub the butter into the flour until it resembles coarse breadcrumbs. Slowly add the cold water, mixing with your hand, stopping when the dough looks like it's about to come together. (You may not need all the water). Form the dough into a disk, cover with cling wrap and refrigerate for thirty minutes. Roll out the pastry on a floured surface into a large circle, approx 5 millimetres thick. Line a 20cm pie dish with the pastry. 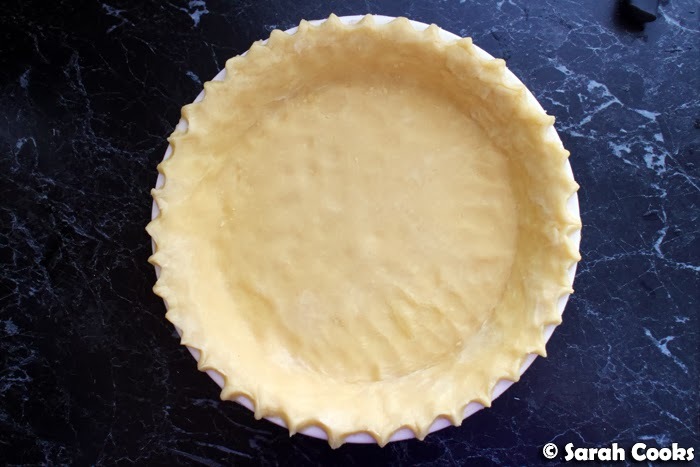 Pinch the edges into a fluted shape. Refrigerate the p1ie dough until you are ready to fill it. Preheat the oven to 180C. 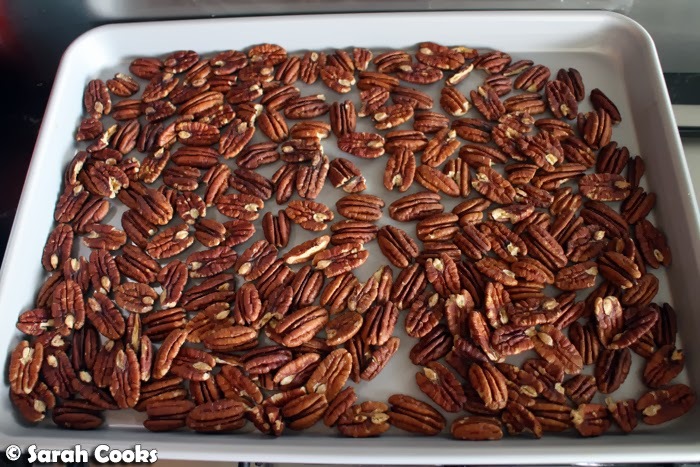 Spread the pecans out on a baking tray in a single layer and bake for 5 minutes or until toasty and fragrant. Tip the pecans onto a cold plate and allow to cool completely while you get on with the rest of the recipe. Melt maple syrup, butter and brown sugar over a low heat in a saucepan. Allow to cool for 10 minutes before whisking in the vanilla extract, eggs and salt. Retrieve the chilled pie dish and place the cooled toasted nuts in it. Pour over the sugary syrup. Bake at 180C for 40 minutes or until the pastry is golden brown and the filling almost set. Allow to cool on a wire rack, before cutting into thick slices and serving with whipped cream. Lordy this looks incredible! It's so hard to find a good pecan pie. Love how you toasted the pecans too! Oh,that would be something great. I really like the combination of maple syrup and pecan ... oh, I guess I had it mostly in ice cream ... but, hey, it's great. I like your changes-toasting the nuts makes a huge different and hello maple syrup! I used to bake pecan pies for a living and I always toasted the nuts. It was SO good! I FREAKING LOOOOOVE PECAN PIE!!! I wanna make this and eat a ginormous slice with a huge scoop of vanilla ice cream..
That looks amazing! I love the crimped edges of the tart actually - very cute. Thanks for this awesome recipe! I made this pie today for my beloved's birthday treat, and it was absolutely delicious. Took an age to cool down enough to cut slices from it but well worth the wait. Yummy!!! Wow, you've been blogging for 10 years- the most I've seen so far (I've only been blogging or just under 2 years). 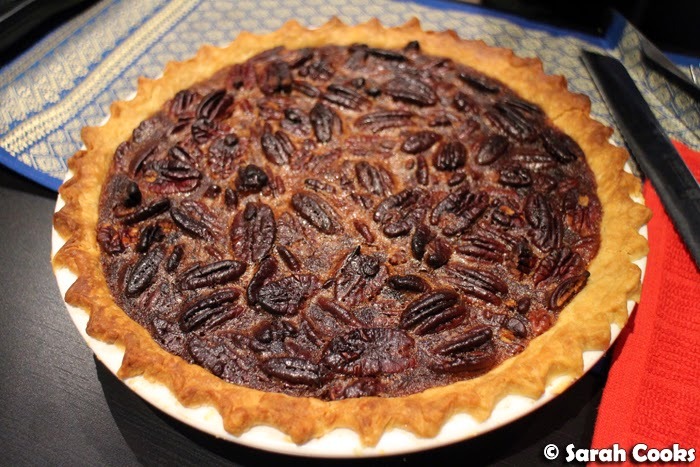 For Thanksgiving tomorrow, I was asked to bake a pecan pie, so Google brought me to your blog (love those search engines)! I followed your recipe but added an egg to the pastry dough and also added some dark rum to the filling- was delicious. 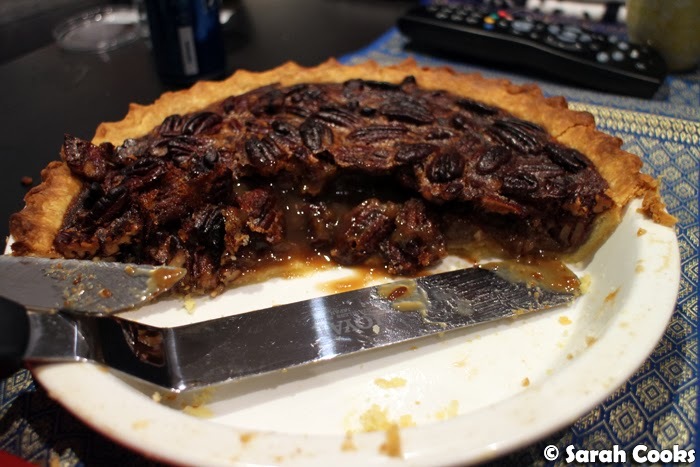 Unfortunately, pecan pie has the most calories of any pie, so I can only have one slice!